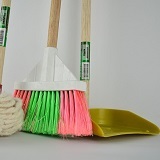 Many people believe that cleaning up a little every day can help keep your house neat and tidy. However, this isn’t true! Tidying up your entire house in one go will help you change your mindset about clutter: you will realize that you don’t want all these unnecessary items in your house, because it looks so much better without them. The instant results you see will give you the motivation to keep your house tidy at all times, and cleaning up won’t feel like a chore anymore! Plus, remember that tidying is not your goal—your lifestyle is. This is why it’s important to tidy up your house in one go instead of stretching it out over weeks or months; once your house is in order, you will be able to go after that true goal and achieve the type of life you desire. Tidy up your entire house in one go. If you tidy your house thoroughly in one go, you’ll be able to keep it tidy long-term (even if you are a little on the lazy side). However, if you begin tidying a little every day, or do not completely tidy your house, you will end up right where you started—with a messy home.